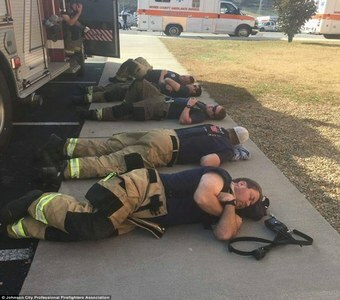 Firestorms in Israel – Firestorms in the USA – Coercion Code – "Dark Times are upon us"
The new story over at the Daily Mail shows us a picture of exhausted firefighters sleeping on the ground in Tennessee, the first sleep they’ve gotten in the past 36 hours of fighting the devastating fires that have led to the deaths of at least 7 and caused more than 14,000 to evacuate their homes in Gatlinburg and Pigeon Forge. Working tirelessly since Monday when strong winds were said to have knocked down electricity lines, starting a number of the fires, what else was shared in the Daily Mail story as shared below is giving people goosebumps. 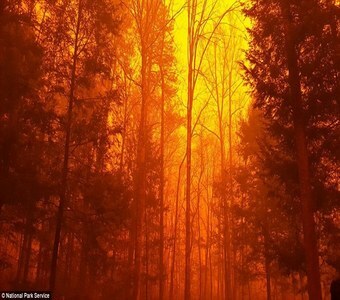 We also take a look below at two amazing videos showing escapes from the fires burning in Tennessee that the Huffington Post called “Like A Vision of Hell” and ‘fire escapee’ Michael Luciano said of the experience: “It was like being in the movie Volcano”. And while authorities are unable at the moment to find any links to terrorism, it might not be a coincidence that only 4 years ago, a magazine put out by Al-Qaeda detailed “how to start huge forest fires across the U.S..with instructions on how to make ’ember bombs'” in a Daily Mail story with a title beginning: “Unleash Hell”. Is it just a coincidence that parts of America look like a ‘vision of hell’ after terrorists threatened to ‘unleash fire hell’ upon America? We also take a look below videos at a new SQAlert in which we’re given another reason to believe these fires might have been set intentionally. UPDATE: Another sign? 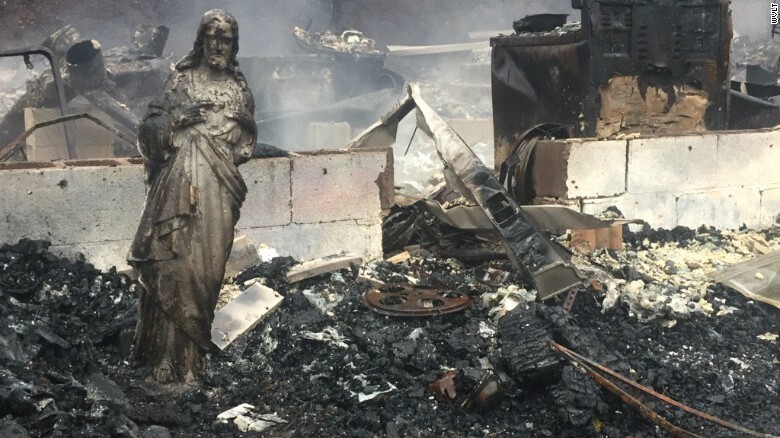 According to Gant News Daily, a statue of Jesus was the only thing left standing in one house burned by the Appalachian fires as reported in this story and seen in the photograph above. 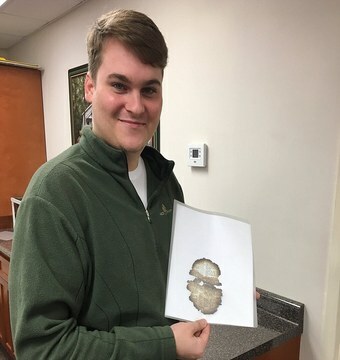 According to Isaac McCord, a 24-year old employee of Dollywood, what happened while he was helping to clean up after the fires ‘turned him white as a ghost’ and made him immediately stop what he was doing. Laying in a puddle of water was a burnt scrap of paper…from the Bible. The burnt paper contained a doomsday prophecy from the Book of Joel. Chapter 2 Verse 1: Blow ye the trumpet in Zion, and sound an alarm in my holy mountain: let all the inhabitants of the land tremble: for the day of the Lord cometh, for it is nigh at hand. 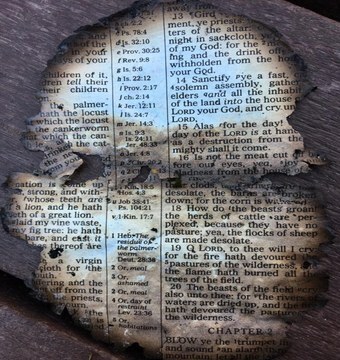 As the new story from the Daily Crow tells us, the fire left behind a fragment of God’s word. You best believe the content of this page was anything but random. Call it a harbinger or call it a message, perhaps as one that would be carried by a pigeon. Pigeon Forge burned but what was discovered soaked in water under a park bench should not be overlooked. Are the fires that are burning now in Tennessee a harbinger of what’s to come? And were they natural fires or caused by arson or terrorism as some have suggested? As this new story from Popular Military tells us, the Tennessee fires coincide with fires overseas that were caused by ISIS or terrorists. And while officials have no proof of any connection to terrorism here yet, the hashtags #FireJihad and #ForestJihad are being used on Twitter to bring attention to this very possibility, and for very good reason as detailed below. ‘In America, there are more houses built in the countryside than in the cities,’ explained the writer known as The AQ Chef according to ABC News. And while it’s large parts of Tennessee and elsewhere throughout the Appalachian mountains now burning and not Montana, as we learn from the Active Fire Mapping Program seen in the maps below, there are still 18 major incidents ongoing as of December 1st in Virginia, North Carolina, South Carolina, Georgia, Alabama and Kentucky as well as Tennessee. Where all of these fires started by natural means or was something more at play?